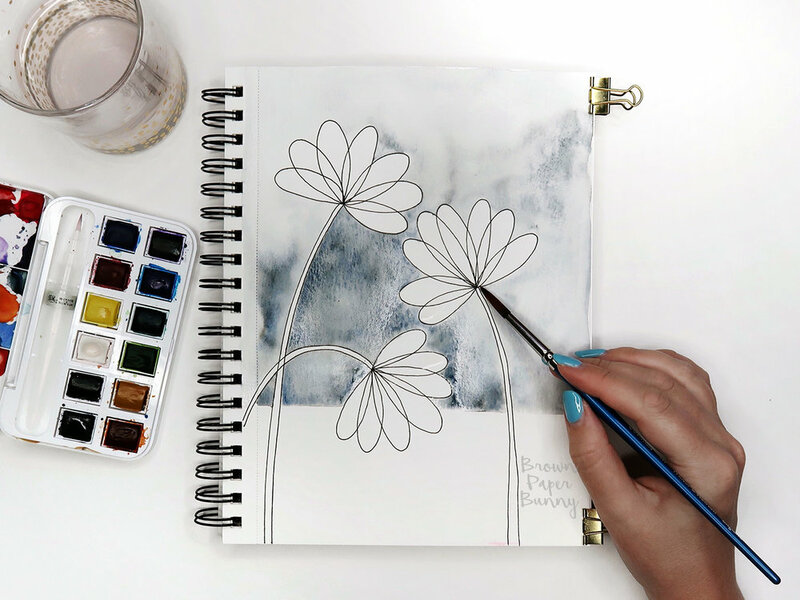 This week I'm going to show you how to create your own mini art journal from scratch. There are lots of reasons to make your own journal: you get exactly the size, number of pages, and type of paper you want. Plus the book itself can be a work of art, and can save you some money too! 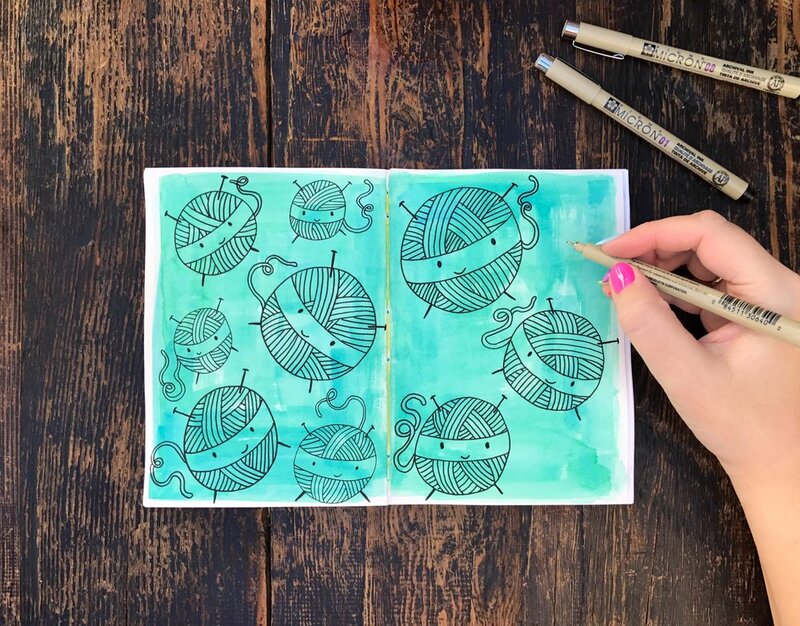 I was inspired by my fellow design teammate Katie Smith, who makes beautiful hand-bound art journals AND is a big fan of Bob Ross! The first step is to cut your paper and journal cover to the size you want (if they aren't already), then you're going to score a line down the middle of each page and the cover using your ruler and bone folder. This helps the paper fold neatly and evenly, especially if you're using thick watercolor paper or cardboard. If you don't have a bone folder you can use anything pointy but not sharp (the back of a butter knife for example). Along the center of one of your pages measure out where you're going to put your five holes, starting with the middle hole and working outwards. You could put more holes if you're making a large book, just make sure you always use an odd number. If your paper is thick you'll want to pre punch the holes using a bookbinders awl, a large needle, or even a metal kitchen skewer. Punch the holes on one page then use it as a template for the rest. Stack all of your prepared pages together inside the cover and you're ready for Step 2! To stitch your pages together using a saddle stitch, thread your needle but don't tie a knot in the end. Start on the inside of your art journal pushing the needle through the center hole. Leave yourself a thread 'tail' about three inches long. You can either go left or right but sew your way through all of the holes until you get to one of the edges, then turn around and sew through the holes to the opposite edge. Once you get to the second edge, sew your way back until your needle and your tail are on the inside of your art journal. Tie the two ends together with a secure knot and trim the ends off. Here's a quick video showing all of the steps. Now that your journal is sewn together you're ready to decorate it. Taking my inspiration from Katie, I filled my journal with lots of color, and quotes from Bob Ross. You could use your journal for anything: drawing your dreams, everything you ate that day, things you see on a walk, lists of your favorite things, a book of maps, poems, pictures of cats...the list is endless! On a lot of the pages I created a background using Dual Brush Pens and a wet paintbrush, then used collage and MONO Drawing Pens over the top. The video below shows a time-lapse of some of my pages coming together, and you can see all of the finished pages at the end. 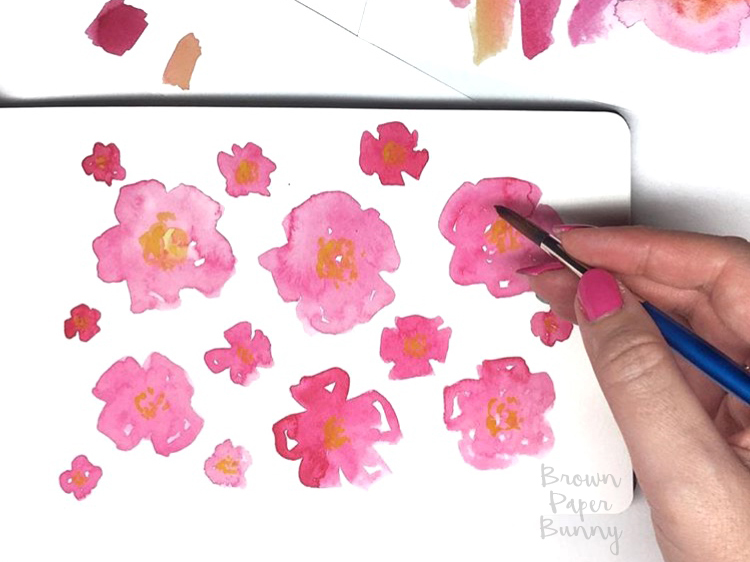 I'd love to see some of your art journal pages, tag @BrownPaperBunny on social media so I can take a look! And in the comments tell me your favorite thing to journal about! I've been a fan of May Designs notebooks for a while now, so when they asked me to create some artwork for their Monday Motivation feature I said 'yes please'! If you watch the news it's easy to think the world is completely falling apart, so my two thoughts for the week are that we need to be kinder to ourselves and kinder to each other. I used Tombow Dual Brush Pens and Mono Drawing Pens to create both spreads. I love that Tombows don't go through even super thin paper, which makes them perfect for sketching, doodling, hand-lettering, journalling and planners. Recently I went on a bit of a road-trip and I used my Tombows and May Designs notebook as a travel journal to document the journey. Here are a few of my stops. Have you ever kept a travel (or regular) journal? Leave me a comment and let me know! For World Watercolor Month I'm participating in CreativeBug's 31 Days of Watercolor Flowers Challenge. So far I've painted Craspedia, Lavender, Hyacinth, Tulips, and Astibe. 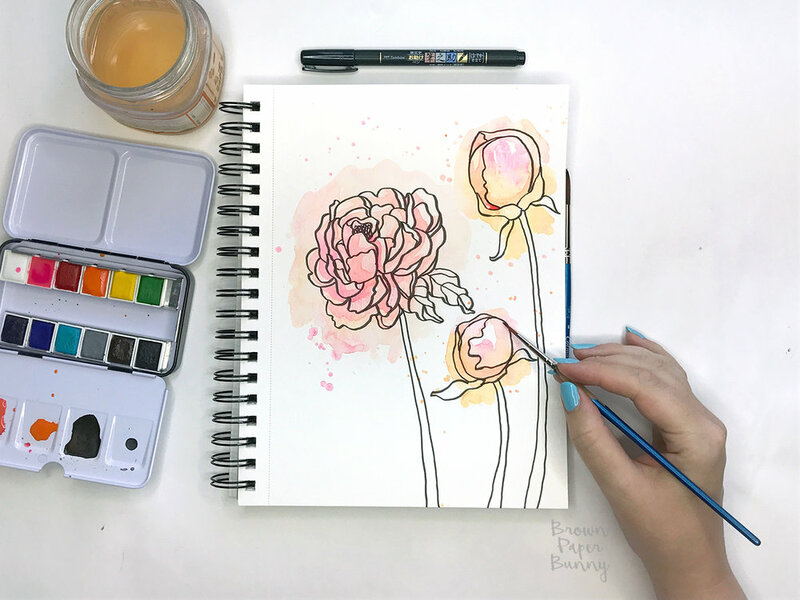 On the opposite side of each sketchbook page I'm creating simple watercolor patterns using one or more colors from the flower of that day. I'm doing the color in watercolor and finishing off with some line work in Mono Drawing Pen. 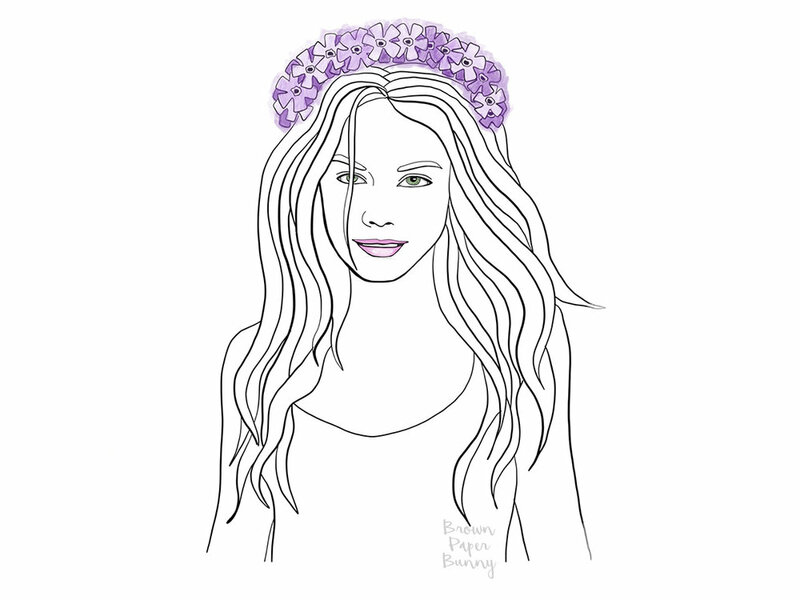 Leave me a comment and let me know what your favorite flower is! 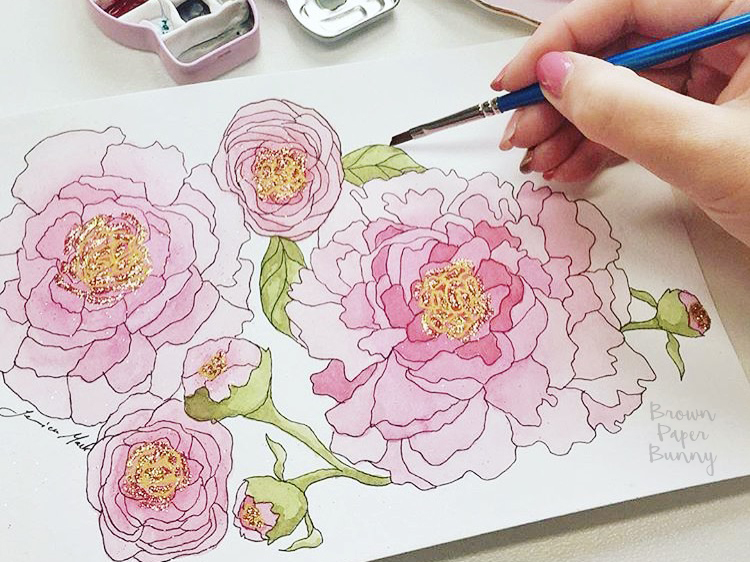 July might just be the best month of the year because it's World Watercolor Month! I'm spending a little time each day creating simple waterolor illustrations in my sketchbook, using minimal color palettes. I'm then adding detail using the new Mono Drawing Pens from Tombow. If you'd like to play along but you're feeling stuck for ideas there is an 'official prompt list' you can draw inspiration from! Leave me a comment and let me know if you're participating in World Watercolor Month! 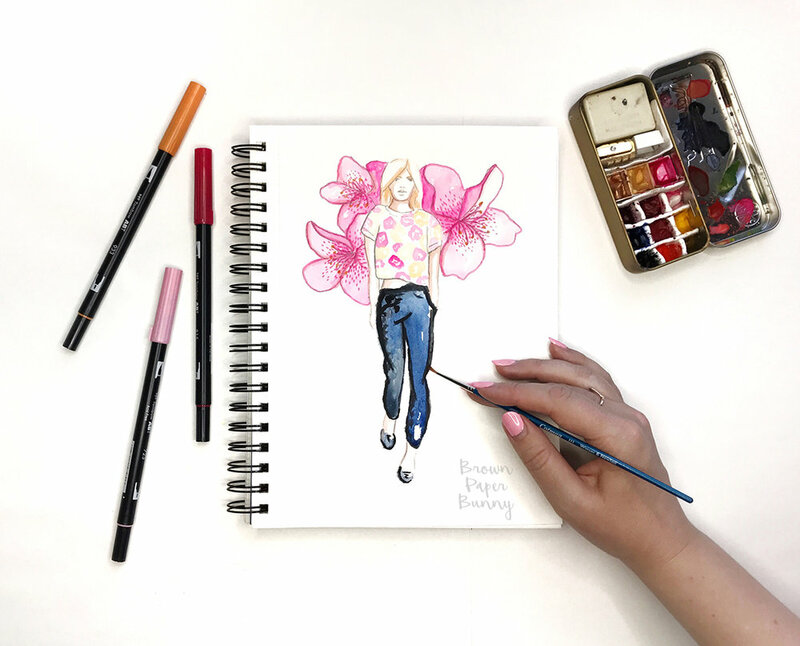 If you've been reading the blog for a while then you'll know I'm obsessed with the Sketchbook Project and have been doing it for almost 10 years (since I lived in Australia)! The deal is, you get sent a sketchbook, you fill it in over a year then you send it back and it lives in the Brooklyn Art Library where anyone can visit and look at it. On top of that they do a mobile library tour every year (probably to a city or town near you). You can also opt to get yours digitized so it can also be viewed online. You can either choose from one of their fun themes to get you going, or you can create whatever you want. 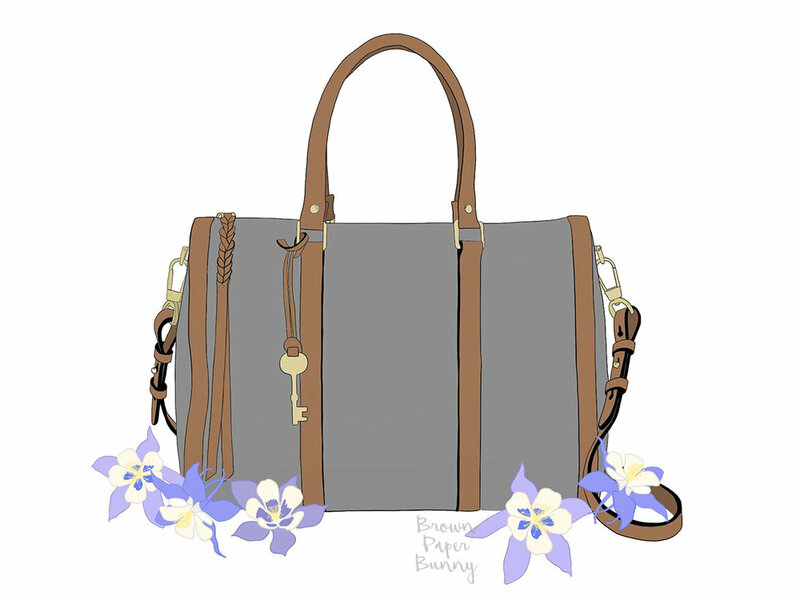 Last year I chose to fill mine with simple, hand-drawn patterns. You can check them all out here. So, basically everything you need to get started! Leave a comment on my Instagram contest post, tagging a friend, and telling me which theme most interests you! One lucky winner will be chosen at random on July 1, 2017. A couple of months ago I decided to participate in the 100 Day Project. It was shortly after my daughter was born and I was going a little stir crazy sitting on the couch and felt like I needed some sort of project to focus on in my free time. Of course I've since found out that life with a newborn doesn't give you any free time, so while everyone else is up to 72/100 I'm still back in the 20s — trying to draw with one hand while holding my sleeping cutie pie with the other. Here are some of my recent entries. You can see the earlier ones here. I'm trying to catch up on my 100 Days of BrownPaperBunny Flowers project...well, as best I can with a newborn at home. Are you doing the 100 Day Project this year? If so, leave me a comment and let me know what your theme is and where I can take a look! 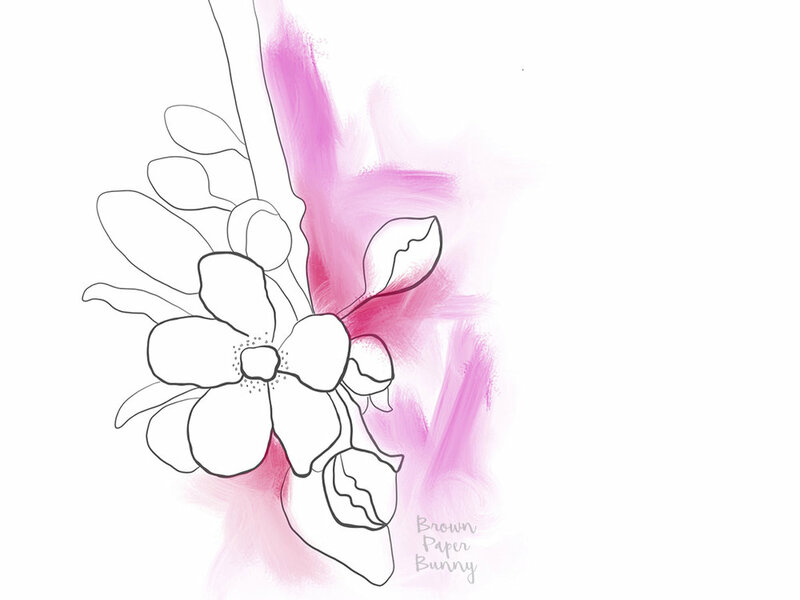 If you'd like to check out some of my other flowers as part of the 100 Day Project, click here. I finally finished my 2017 Sketchbook Project Book, with the theme of hand-drawn, repeating patterns. It was a really nice project to work on in-between other commissions and illustrations. And because I kept it simple and just used ink over watercolor backgrounds I found it quite relaxing to do. 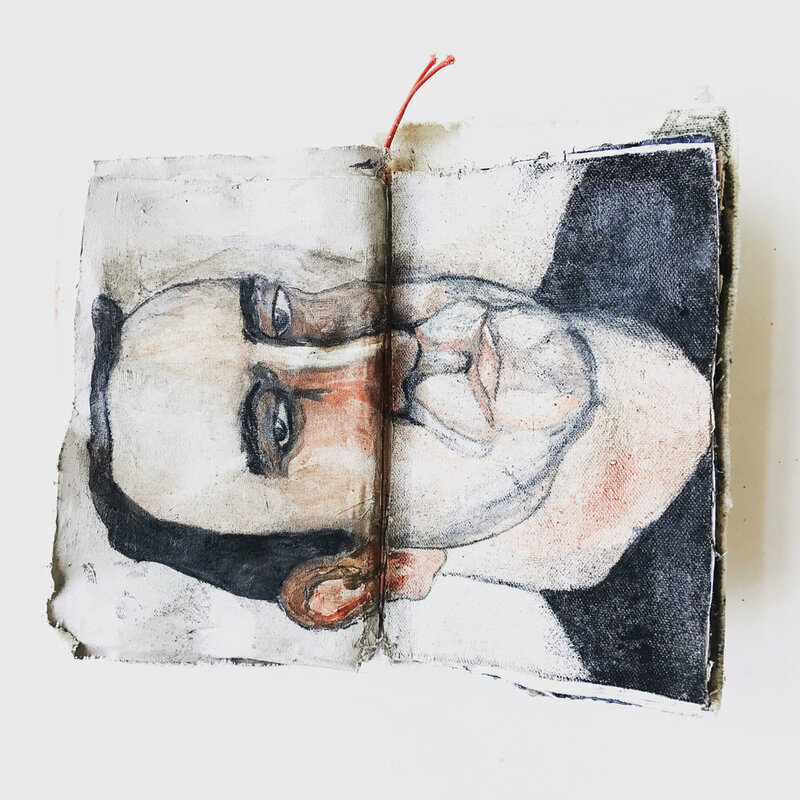 If you haven't heard about the Sketchbook Project before, check out more details here, it's very cool! I also got the chance to test out Instagram's newest feature where you can upload multiple photos and videos as part of one collection. This could be really fun for us artists, giving us a chance to show a piece in progress, and add both videos and photos to really tell a story, rather than just choosing the best image to try and portray the whole thing. Let me know in a comment if you can think of any other ways you'd use the new multiple photo/video upload to show off your work? If you haven't played with the new feature yet, here's how I used it. And here is the video from Instagram, explaining how the new feature works. I've been working away in my Sketchbook Project book, creating hand-drawn patterns over watercolor — and trying to get it finished before the return deadline. 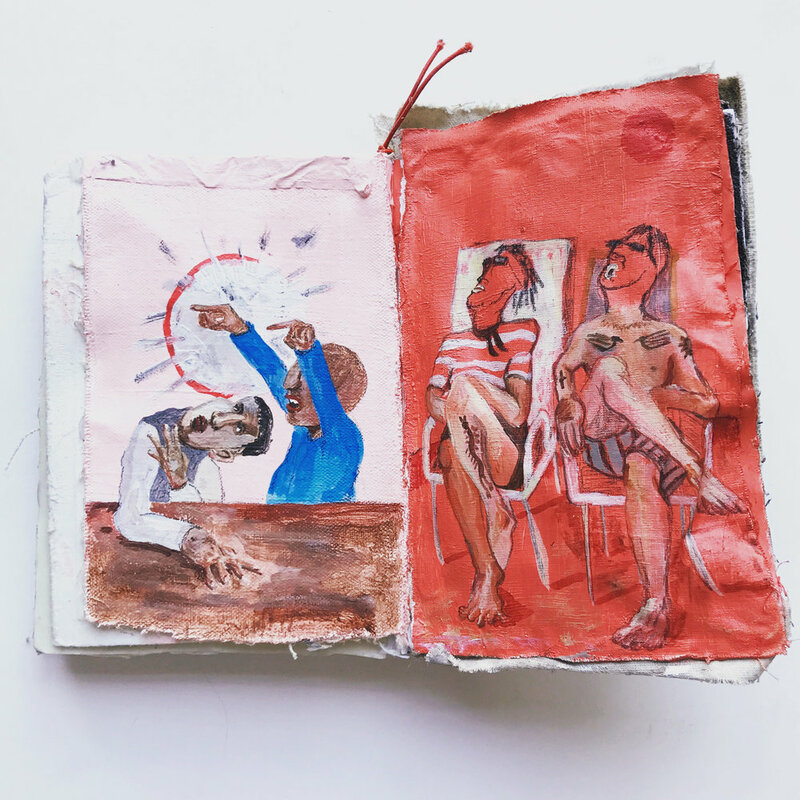 If you're not familiar with the Sketchbook Project, it's a cool initiative run by the Brooklyn Art Library where you sign up, they send you a sketchbook (which you can use as-is or re-bind like I've done). You fill it with your art, collage, drawing, whatever you like really, and you can choose to follow a theme or just see where your creativity takes you. Then you send it back to them before the deadline and it goes on a mobile sketchbook tour, around the USA and the world, the following year. People who visit it on the tour can 'check out' your book from their little mobile libary and look through it. Then after the tour your book goes to live in the Art Library where you can visit it (and thousands of others) whenever you're in the neighborhood. I've been doing the project for years, since I lived back in Australia, and am completely in love with it. The first time you have to send your book back it can be a little sad because you feel like you're saying goodbye to something you worked so hard on, but then once you start seeing other people enjoying your work, it becomes really fun. Plus you can go visit it anytime you happen to be in Brooklyn, so it's not really 'gone'. Anika, over at @AisforAnika put together a month of pattern challenges / inspiration to get the year off to a good start, and it's been wonderful seeing how differently everyone interprets the prompts. This January has been busier than usual for me, so I haven't participated as much as I would have liked, but here are just a few that I've done so far. Did you participate in any group challenges or projects this month? It's number 13 on my list '21 Social Media Prompts for Artists' — if you haven't download the list already, you can find it here (it's free). 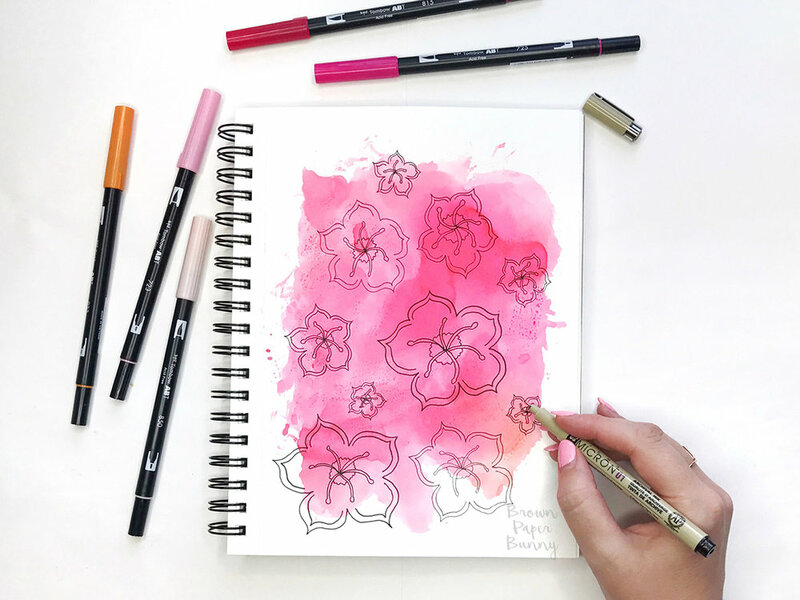 To start the year off right I'm taking Lisa Congdon's Creative Bootcamp over on CreativeBug. I'm trying to loosen up and let myself experiment more with colors I wouldn't usually use, and exercises that, at first, feel very foreign to me. And I'm having a lot of fun! Here are just a few of the creations I've made so far, following each week's exercise. I hadn't done any collage since I was a kid, so it was really fun to get out the scissors and glue and go to town! I painted these little geometric guys for National Bird Day today. Creating content in line with 'Days of the Year' is idea number 11 in my free guide '21 Social Media Prompts for Artists'. Throughout January a group of us are participating in a challenge to lift our social media game, and posting ideas from the guide. If you want to kick 2017 off right, get more attention for your artwork and grow your community, join us! Here are the details for the January Challenge.